So, a new Toyota hybrid car! If anyone doubts the future of hybrids in reducing effects of global warming, the 2007 Tokyo motorshow had no fewer than 8 concept cars and 13 other Toyota cars on view. 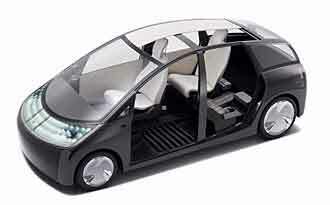 The Toyota 1/X concept car. Like sitting in a greenhouse while beating greenhouse gas effects! You might be amazed at the prices for which you could pick up a fuel-efficient car at auctions. Like the 2007 Toyota Prius that we found, sold for under $6000! Maybe your Toyota hybrid car is just waiting for you! Narrower internal pillars for a better field of vision. It's 'plug-in' ability allows you to recharge its batteries from the grid. Of course, how much that will save on CO2 emissions will depend on how green your local power plant is! Oh, and with it transparent, clear roof you will be able to experience a greenhouse atmosphere as you drive... Warm! Whereas the carbon fiber body has its important advantages, not least fuel-efficiency caused by its light weight, there are serious environmental problems. There is some confusion whether Toyota will actually mass-produce cars in carbon fiber. But if it is, this seems a huge landfill problem. Uhh... There are over 600 million cars on the planet now with projections for that to double by 2030. But then, maybe we'll just keep refitting the bodies of used hybrid cars, Toyota hybrid car or not, with replacement engine and parts when worn out? Deep green/beige contrast colours in its interior. The i-REAL is made as close to human scale as possible.As a throwback to the old Goggomobile (if you remember those you're as aged as I am!) it features two wheels at the front and one behind. It's wheelbase lengthens with increased speed, aising smoother driving performance. It has perimeter monitoring sensors to detect and avoid possible collisions with persons or objects. The iQ CONCEPT is highly compact – just three metres long . Still, it can fit three adults and a child and aims for outstanding fuel efficiency to reduce CO2 emissions. The Hi-CT is meant to be a 'fun' vehicle.Length 3,330mm x width 1,695mm x height 1,780mm and uses plug-in hybrid technology. Its AC 100V accessory socket enables stored electricity to be used for any appliances. The FT-MV is a minivan. The Crown Toyota has always been a luxury sedan. Now it's even better. The Crown Toyota Hybrid Car Concept's latest hybrid system is the VDIM (Vehicle Dynamics Integrated Management). It allows an advanced fusion of driving, environmental and safety performance.It features a hybrid system with a two-stage motor speed reduction device, helping smooth acceleration, low greenhouse gas emissions, high fuel efficiency and a quiet run. Its VDIM is said to ensure great vehicle stability, active steering control, a safety feature aiding optimal balance among drive power, steering and braking.Ten (!) airbags for greater safety. This is a hybrid sports car. It combines environmental responsibility with driving adrenalin. Said to offer a smooth drive and high fuel efficiency. Rear-wheel drive, reduced greenhouse emissions and a quiet drive, even with its 3.5 litre V6 gasoline engine. II. TF107 Formula One racing carThis F1 racing car is competing on the tracks now. High aerodynamics and a reliable engine give hopes for the first Toyota F1 win. So, that wraps it up for Toyota's Tokyo Show for 2007. Remember, a truly sustainable world depends on your thinking about your connectedness with others and your environment – a theme for some of these hybrid concept cars. Green cars are only one expression of that, they cannot be the change we need. Convert Your Car To Electric. Here's How!